Reactor slot might have a very scientific name but is actually quite simple in construction as we will soon discuss. 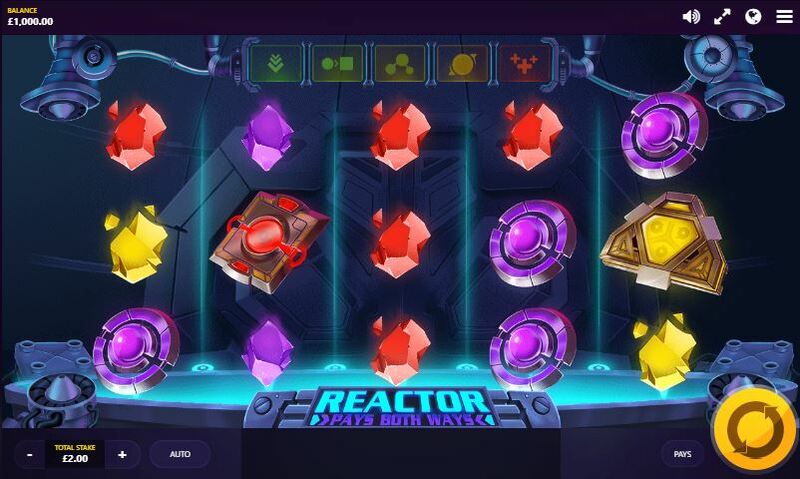 The game is centred around passing electricity through various reactor part and crystals and aside from the usual Red Tiger 'springy' sound as we spin there is some gentle futuristic music in the background of this colourful slot. There are echoes of Play'n Go's Reactoonz here combined with the simplicity of Netent's Starburst to make a game where all the action is confined to the base game. Will our bankroll avoid becoming critical here though and escape a meltdown? 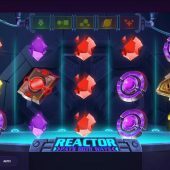 Symbols appear stacked on the reels of Reactor slot which gives us a standard 5 x 3 grid and we pay 20 coins for our 20 paying lines which pay both ways i.e. from right-to-left too. The 5-of-a-kind pays are 25x for the single Wild, 20x Yellow and Green component, 16 Brown and Yellow and 12x Red and 8x for the Purple Component. The minor pays aren't card values but instead we see Green, Yellow, Red or Purple Crystals paying 90 down to 30 coins respectively in stages of 20. We don't see any scatters as such to trigger any free games but on some spins a Battery may appear on one or more reels and these are needed to power up our in-play enhancements! Above the reels you will see 5 different symbols which are illuminated in sequence for every Battery appearing in view. A single Battery anywhere will activate the feature above reel 1, two Batteries in view activate both the features above reels 1 and 2 and so-on. If you land all 5 Batteries up to 5000x bet is possible according to Red Tiger, so what happens to get anywhere near achieving this? 1 Battery - Awards a respin which produces a win. 2 Batteries - Respin plus a symbol swap to make the wins better. 3 Batteries - Respin, Symbol Swap plus some random Wilds added. 4 Batteries - Respin, Symbol Swap, Random Wilds plus a Mega 2x2 or 3x3 Wild in view. 5 Batteries - Respin, Symbol Swap, random Wilds, Mega Wild plus random multiplier of 2 to 10x. That's pretty much it, you're hoping for at least 3 Batteries for anything notable in the range of wins on Reactor slot. See 4 or 5 and you should be celebrating!